No spot in baseball is more a wild card than bullpen closer. Former Tiger Jason Grilli, now 36, is leading the major leagues in saves with the Pittsburgh Pirates. As recently as 2011, he was hanging on in baseball by a thread in the minors with the Philadelphia Phillies' organization (he was released that July and signed the next day with Pirates). For most of his major league career, Grilli's role hasn't been much different than it was with the 2006 Tigers - a mop up with a big-time arm. Eleven of Grilli's 16 major league saves came within the first month of this season. Yet, it doesn't always work that way. Atlanta's Craig Kimbrel is arguably the best closer in baseball. He was the classic top prospect, who hit his projected high ceiling. The background of closers has a wider variety than other positions. 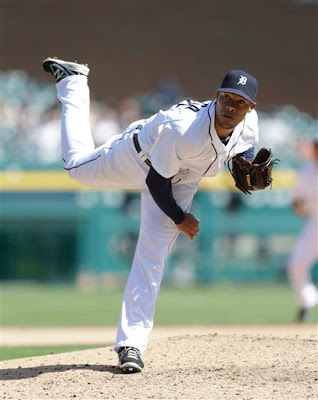 In Detroit, we've mostly focused on Bruce Rondon as the Tigers' closer. He's a massive man with a big-time fastball and a decent track record as a minor league closer. He is just 22. But while all the focus has been on Rondon, perhaps 24-year-old Jose Ortega is coming pn. Unlike Rondon, Ortega is a shorter, slightly-build right-hander. He doesn't have a track record as a minor league closer. But he got off to an excellent start at Triple-A Toledo (14 scoreless innings, just 12 base runners, more than a K per inning). He only got one save for Toledo, but he was sure impressive Wednesday for the Tigers vs. Minnesota. Could Ortega, who throws in the high 90s, close? Currently, Jose Valverde is the Tigers' closer. His results since returning from a short exile following a playoff meldown have been good. What hasn't been as impressive is the way Valverde is actually pitching. His command hasn't been particularly sharp. nor has he displayed much in the way of an off-speed pitch. Time will tell how this will shake out. Al Alburquerque still has command issues, but has shown better ability to bounce back quickly outing-to-outing. He could be another option. He is throwing hard and his slider is a brilliant pitch. What it all does is buy the Tigers' time to sort out the situation. There are viable options to sort through other than Rondon until a decision whether to deal or not will have to be made near the trade deadline. As for Rondon, no harm, no foul. He wasn't up long enough that the Tigers burned up a minor league option. He did get some major league experience. There is still time for him to sort out his issues at Toledo.